This past Monday the official ground breaking event took place to start the redevelopment of the old City Square Mall. 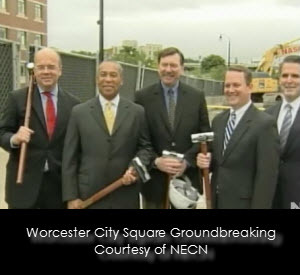 A project that has taken more than a decade to come to fruition, it is a testament to the will and persistence of many in Worcester that were ridiculed early in the thought process. The Telegram does a good job of chronicling a local architect’s role (Daniel Benoit)in the project and some of the negative feedback he received early. This week I am sure he is seen more as a thought leader. Add to that list former Mayor Tim Murray(current Lieutenant Governor) who also has been instrumental in continuing to keep the project alive. The ceremony was attended by hundreds of people including Governor Patrick, Lieutenant Governor Murray, Worcester Town Manager O’Brien, Congressman McGovern and Hanover CEO Frederick Eppinger. The project is planned as a mixed use development to include not just shops but offices and apartments as well. One of the biggest factors in finally making the project happen was the signing of a 17 year lease with disability insurance company Unum which is planning on making Worcester it’s new headquarters. This will provide them with a chance to expand and offer more employment opportunities for Worcester area residents. Of course Hanover Insurance stepping up as an investment partner was also crucial. The public is also contributing with grants from the state. This new project will not only bring jobs but it will change the look of downtown Worcester. One of the main goals of the redevelopment is to reconnect downtown to the east side of the city. Just getting rid of the parking garage would be a facelift but the project looks to be visually impressive. The project is set in phases with the first phase concentrating on the office space for Unum which is currently scheduled to be finished in 2012.